Oxford, Maine -- Joe Pastore of Gorham claimed a rich, $3500-to-win victory Saturday afternoon in the Gravely Street Stock Nationals presented by Dave's Small Engines at Oxford Plains Speedway. Pastore started from the pole position, but never built much of a lead, battling Scarborough's Frank Wear for much of the 125-lap distance, with Nicholas Cusack of Scarborough taking up the challenge in the closing stages of the race. Both Wear and Cusack managed to get a nose up on Pastore in the outside groove, but no one could complete the pass, and Pastore prevailed. Cusack claimed runner-up honors, with Wear hanging on for a third-place finish. 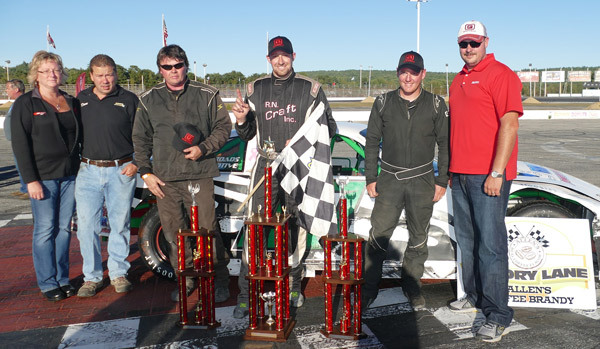 Calvin Rose, Jr., of Turner, posted the best finish from among the Budweiser Championship Series Allen's Coffee Flavored Brandy Street Stock regulars at Oxford Plains Speedway, crossing the finish line in fourth position against the more exotic invaders in the open competition event. David Whittier of West Poland rounded out the top five. Pastore, Billy Childs, Jr. of Leeds and Bryce Mains of Naples won heat races. Jon Lizotte scored the 100th Figure 8 division of his Hall of Fame racing career, and 14th win this season, in the Wood Pellet Warehouse-sponsored class. Auburn's Eric Hodgkins was the best of the rest, with Monot's Geoff Low outgunning Tommy Tompkins of Carthage for the final trophy. 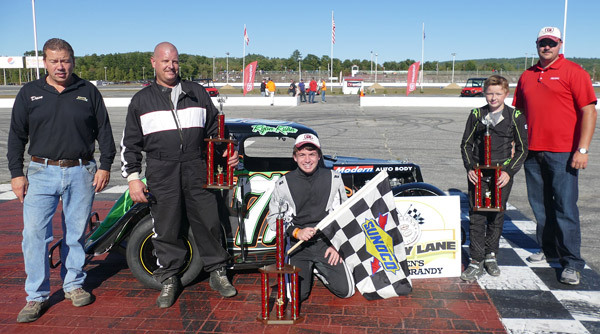 Jamie Heath of Waterford raced to victory lane in the 30-lap main event for Bandits division competitors. Heath, who had failed to finish several races in the Neon he drove to the win in recent weeks, easily outdistanced 2015 division champion Shaun Hinkley of Oxford en route to his win. Brandon Varney of Auburn chased Heath and Hinkley under the checkered flag. Dan Wade of New Gloucester and Josh Knoll from Mechanic Falls rounded out the top five. Wade and Greg Durgin of South Paris won Bandit division heat races. Ryan Kuhn of East Bridgewater, Massachusetts powered to an impressive win in the 25-lap main event for INEX Legends Cars. Young Austin Teras of Windham led the early portion of the race and held off all but Kuhn to claim runner-up honors. Michael Humphreys of Cornish was third under the checkered flag, with the top-five filled out by Thomas Everson of Gilmanton Iron Works, New Hampshire and Portland's Patrick Dillon. Kuhn won the heat race. The AIM Recycling USA Pro All Stars Series North Super Late Models and Modifieds wrap up their championship seasons on Sunday, October 4 at Oxford Plains Speedway. INEX Legends Cars and a Mini Stock Open are also scheduled for that program, which gets underway at 1:30 p.m. For more information please visit oxfordplains.com or call (207) 539-8865.
on Saturday, September 26, 2015. Gravely Street Stock Nationals (125 laps) 1 20 Joe Pastore, Jr., Gorham; 2 15 Nicholas Cusack, Scarborough; 3 20x Frank Wear, Scarborough; 4 8 Calvin Rose, Jr., Turner; 5 58 David Whittier, West Poland; 6 1 Billy Childs, Jr., Leeds; 7 77 Bryce Mains, Naples; 8 23 Zach Emerson, Sabattus; 9 83 Dan Brown, Peru;10 30 Geoff Rollins, Groton, MA; 11 45 Cole Watson, Naples; 12 47 Brian Caswell, Portland; 13 59 Josh Childs, Oxford; 14 33 Andrew Breton, Sabattus; 15 8 Wayne Reynolds, Norway; 16 97 Michael Haynes, Livermore Falls; 17 6 Dave Cameron, Alfred; 18 24 Jonathan Emerson, Sabattus; 19 3 Jordan Russell, Norway; 20 29 Trace Beyer, West Dover, VT; 21 04 Zach Bowie, Greene; 22 11 Tyler Trott, West Hartford, CT; 23 71 Jason LaValley, Auburn; 24 56 Mike Short, Auburn; 25 4 Tyson Jordan, South Paris; 26 36x Nathan Leavitt, Buxton; 27 28 Josh Varney, Leeds; 28 113 Tommy Tompkins, Carthage; 29 36 Rick Spaulding, Lisbon; 30 63 Matt Dufault, Turner; 31 8 Ron Bolduc, Plaistow, NH; 32 7 Mark Lundblad, Jr., Albany, NH. Wood Pellet Warehouse Figure 8 (15 laps) 1 27 Jon Lizotte, Mechanic Falls; 2 97 Eric Hodgkins, Auburn; 3 6 Geoff Low, Minot; 4 113 Tommy Tompkins, Carthage. INEX Legends Cars (25 laps) 1 72x Ryan Kuhn, East Bridgewater, MA; 2 29 Austin Teras, Windham; 3 72 Michael Humphreys, Cornish; 4 4 Thomas Everson, Gilmanton Iron Works, NH; 5 45 Patrick Dillon, Portland; 6 80 Dalton Varney, Windham; 7 83 Peter Craig, Poland; 7 21 Parker Varney, Windham; 9 399 Bobby Weymouth, Topsham.